WHOA, it’s THE DEMONS OF SORROW hunting Genchu! This isn’t totally out of the blue, it was actually discussed way back on this page, although one might ponder upon the lack of Tadashii…? If this page looks a bit different, there’s a reason. I’ve been using Photoshop’s pencil brush tool to ink for a looong time because it makes putting in color fills super fast and easy, but it has left me very unsatisfied with the actual tedium of inking simple, closed shapes. I dunno, I just decided to go more free form with this page and inked it with an antialias hard edged 4 pixel brush like I often do with side sketches I post on tumblr. The results are pretty subtle but it did make the page a whole lot more fun to ink! Albeit, a lot less fun to lay down the flat colors. GIVE AND TAKE, that’s the way of things! Wait, he stabbed your other dog. Shouldn’t you be more worried about that one? Eh, that dog was two days away from retirement anyway. Plus, it was starting to show off pictures of its boat. He gave that one an honourable death, I guess? You’re saying being kicked into a tree isn’t honorable?? I mean honourable (the ‘u’ makes it so much more British). Mastery of the silent u makes us great ;). Why shouldn’t a Samurai dog also live and die by the sword? The lack of thumbs makes it rather difficult for dogs to wield swords . . . prolly why at least one of these dogs had sharpened claws: it was envious of it’s human master’s ability to cut things. Sometimes dogs get cut, but kicking dogs! That’s just mean. Genchu uses Diplomacy! It’s not very effective… Genchu fainted! NNFB Reader blacked out! Genchu used CUT, it’s super effective! Tadashii’s standing on a nearby hill watching the battle unfold while sipping tea. Evil tea. The kind that’s really expensive but tastes like fermented tree bark. Tadashii would be very particular about his evil tea. That smoke bomb’s going to make aiming those arrows harder. Uso is the poison guy, not Ryoushi. Now I’m confused. Is this before or after the “Spanish Trader” strips? And were those strips running at the same time as the main crew’s? I guess one would answer the other, since Uso is dead in the current time. This is shortly after Genchu left Wataro castle, when the demons of sorrow were first assembled. Notice the dog guy is there, whom we know is killed by Genchu. 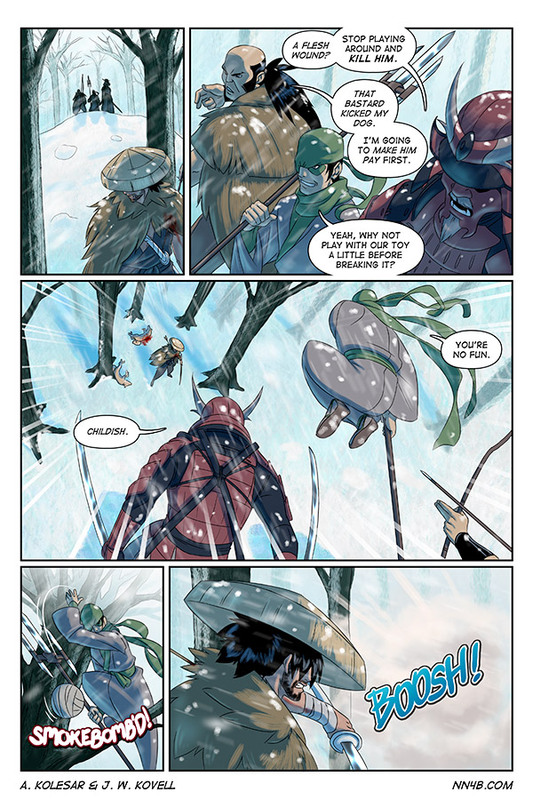 But what of the strips featuring Genchu and the priest/ gun trader? Are they before or after this? I am well aware that Uso was killed when Yori saw through the disguise. Here. Let me try this again. Knowing that this takes place before the main story, Is this particular scene before or after the scene where Genchu is talking with the priest and the gun merchant, and helping said merchant secure a deal with the Wataro? Renadt, the answer to that should be cleared up at the end of this scene. Allow me to clarify. This is before the scene you’re thinking of. To put it in an understandable sequence: Genchu leaves Wataro castle > This Scene > Plot of No Need For Bushido up to where we left our group > Scene with the gun merchant. Does that answer your question, or might I be of further help? YES! Yes it does! Thank you. Leavescat, thank you for easing my panic over the coherency of our story timeline. Here’s a cookie. No, take it. I WANT YOU TO TAKE IT. It’s the fastest cookie in the fleet, take it. An arrow through the lung is a “flesh wound”? That guy’s watched too much Monty Python. Still better than an arrow through the heart. You can actually survive a punctured lung. And as long as the arrow is still in the wound, it prevents the air from leaking out and the blood from leaking in, meaning you may still be able to fight. If “better than an arrow through the heart” is your standard for “flesh wounds”, you too have watched too much Monty Python. And usually, once the arrowhead’s come out the other side, the shaft isn’t gonna be as effective at sealing the wound. I want to warn you, EternalLurker, we may be challenging your suspension of disbelief with this scene, and for that I apologize. It’s more, like, above the lung, let’s say. Perfectly survivable, DON’T QUESTION MY KNOWLEDGE OF ANATOMY! Ah, that makes sense. Clearly Genchu’s lungs have to be smaller than a normal person’s to make room for his amazing pectoral muscles. I am totally okay with this. Okay… so, I’m a little confused… the guy in the fur cape is in the snow, fighting wild dogs, gets an arrow in the shoulder… and then we find out the dogs were owned by someone, the arrow came from his partner, and the third guy just wants to kill the guy with the fur cape… who are we rooting for in this fight? The tactical one, the pet owner, the playful archer, or the animal abuser? To be fair, the dogs were attacking Genchu first, so Genchu. Although that’s true, I suppose it is a little ambiguous. I should’ve given the dogs some dialog. Dog2: No, I’m taking him NOW! My thought was that there are better ways of getting dogs to not attack you… like bacon. No dog can resist bacon. Although I love the Star Wars: Attack of the Clones reference! Having bacon on your person sounds like the perfect way to make a dog attack you. I disagree vehemently with this. Funny, I’ve carried bacon for months, and none of the dogs I’ve had run-ins with have ever attacked me. Surely the ones I’ve encountered couldn’t have been aggressive… let’s see three rottweilers, two pit bulls, a chihuahua, about five German Shepherds, and quite a few doberman pinscers just on my block. When they first met me, they would growl and bark, now when they see me coming, they come up, lick my hand, I give them all a small piece of bacon, and pet them. The difference is that these dogs are trained attack do — Wait…wait….Why have you carried bacon for months? I was using the bacon as snacks to get through the day. The protein and fat helped with my workouts, kept my mind sharp during classes, and tasted good after prolonged periods of time out in the heat. It was on the fourth or fifth day that I realized that some of the dogs in the neighborhood might like some when I was returning with only half of my bacon gone, so I shared it with them. You carried bacon for prolonged periods of time out in the heat? If you can’t determine who’s on the moral high ground, just root for your favorite character! Can’t go wrong with that logic. 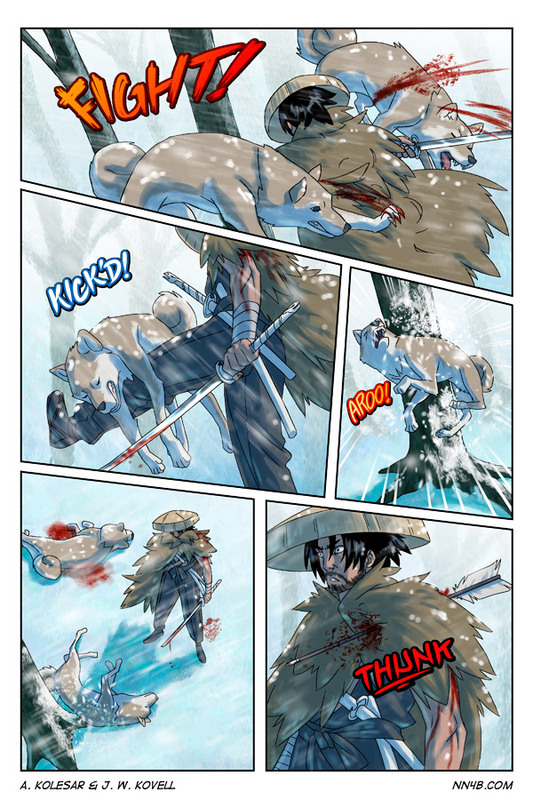 Favorite character of this comic isn’t even in this scene… I’ll just root for the dogs. Which character would be the favorite, out of curiosity? For me, specifically? Cho. Second is a three way tie between Ina, Ken, and Yori. I put Cho at the forefront because he’s both badass and funny, but Yori, Ken, and Ina are pretty much bland in comparison. Yes, Ken’s a badass, but his constant, unchanging “I must have revenge… ooh Sake” grates on me, while Yori’s white knight fighting in a family of darkness, and his corniness brings him up to Ken’s level, but only makes them just about as likable as Ina in my mind. Mind you, I only like Ina because she’s a wonderful tactician, tough as nails, and yet she’s been relegated to “damsel in distress” since the first time Yori met her. We’re basically following all the tropes with those three, but with Cho, you guys broke the mold. That’s another reason why I grouped all three of them together as my second favorites, because although they slip further and further into the madness of their stereotypes, they also make fun of those stereotypes by their words and actions. Honestly, I noticed that with other females Yori is clueless. It’s only Ina that he seems crazy about.